Route 66 Chicago 6000 (90-434-3037-4) €0.00 including FREE DELIVERY - buy online at mysatnav.ie Ireland - FREE SHIPPING. To avail of a free update DVD with the latest maps for the whole of Europe, once you have purchased from us, you must register and activate the Route 66 Chicago 6000 GPS system. This DVD will be posted out to you by Route 66 and you should receive it within 10-14 days from date of purchase. This is a limited offer only. Up to the 31st July, Route 66 are offering a free "Maps of Europe" DVD for all Chicago 6000 navigators. 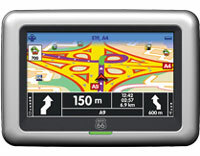 The DVD, with a suggested retail price of �119.95, includes door-to-door navigable maps of 37 European countries. To load the maps onto your Chicago 6000 we recommend that you use either a standard 1GB or 2GB SD card (Sandisk preferably) with a SD card reader/writer.